Thread: Ever thought of renting a PC? Sorry for long post but worth the read if you're a PC gamer or into cool tech stuff. I recently found out about this through a Facebook ad - normally they are crap and I never click on them but this one intrigued me. You might have heard of OnLive about 9 years ago - I had that piece of kit, at best it was just okay a bit laggy though. This is much better. Though the whole cloud gaming concept is pretty new it works great and will get better. Some minor flaws such as my mic sometimes not working - but i work around that using discord on my local PC/laptop instead of the shadowpc. The developers are very active and always adding new features and fixing bugs. I'm sure if you Youtube "shadow tech" you'll see some people testing it out. Essentially you get a very good gaming PC to rent for £27 a month. Very good CPU (i7 or equivalent), 12 GIG RAM and GTX 1080 or equivalent Graphics card. The Hard drive is a bit small @ 256GB but you can upgrade that to 1TB for an additional £2.95 a month. They also do free component upgrades over time. It doesn't have to be used for gaming - I am using it as my desktop you can also use it for video editing. So essentially I've turned an old laptop into powerful gaming machines thanks to the Shadow App. This worked for me as I was going to upgrade my PC then realised i couldn't afford it. For £27 a month I get a great gaming machine which i don't have to worry about electricity to run it, cost to buy it or fix it if it breaks. Think about how much you'd pay for a very good gaming machine - you're talking about the guts of £1000, probably more the GFX card will cost you £600+ - (thanks crypto miners ) instead you're playing around £324 a year. 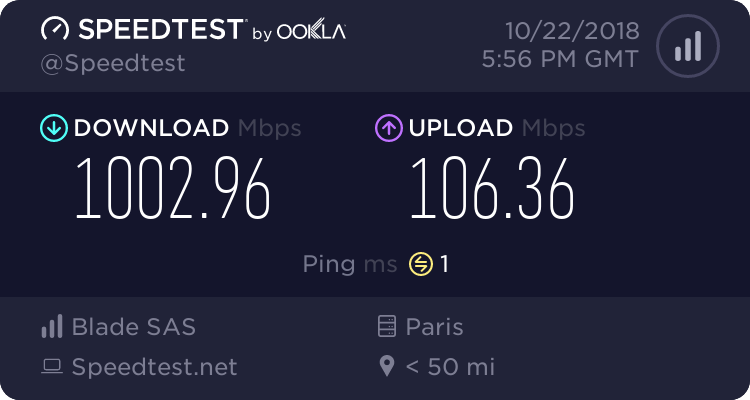 Oh I forgot to mention the speed of the internet you have, I did a speedtest recently: and got http://www.speedtest.net/result/7738178009.png! If you are a Macbook person - you can play windows games on your Macbook by running the shadow application which will connect you to your Windows PC in the cloud. So if you're thinking of upgrading your PC AND have a good internet connection (above 20Mb) - give this a try for a month to see what you think. Not bad for £17 for the first month! A very welcome new user! Sig is gone! Please read the sig rules before applying one!